Originally a fully functioning bakery from 1876 - 1936, the curious latticed building at the north end of Congress Avenue went through a number of interesting incarnations before the City of Austin took it over in 1976. 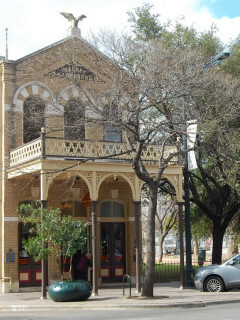 Today, the Old Bakery is a City of Austin visitor's center and a crafts exhibit hall that benefits the senior citizens that sell their arts and crafts here. In addition to community arts and cooking classes and demonstrations, the handwork of older Austinites is exhibited and sold at arts and crafts fairs. Prior to Christmas, the Old Bakery and Emporium adds Saturday hours from 10am - 2pm for additional craft sales and baking classes.